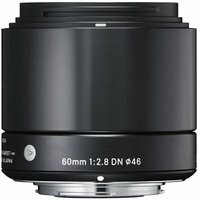 The Sigma 60mm f2.8 DN Lens is a high-performance, mid-range telephoto prime with large f2.8 aperture for use with Micro Four Thirds compact system cameras. Sigma's new range of DN lenses fall into Sigma's 'Art' line of lenses and deliver the finest in materials, usability and functionality. Weighing only 190g and being 55mm in length, this travel-friendly lens offers an angle of view of equivalent to 120mm on the Micro Four Thirds system. The SLD (Special Low Dispersion) glass reduces aberrations and maximises image quality from the center to the edges. The Sigma 60mm lens offers a minimum focusing distance of 50cm and a maximum magnification ratio of 1:7.2, this lens is excellent for taking shots with a pinpoint focus on a subject.